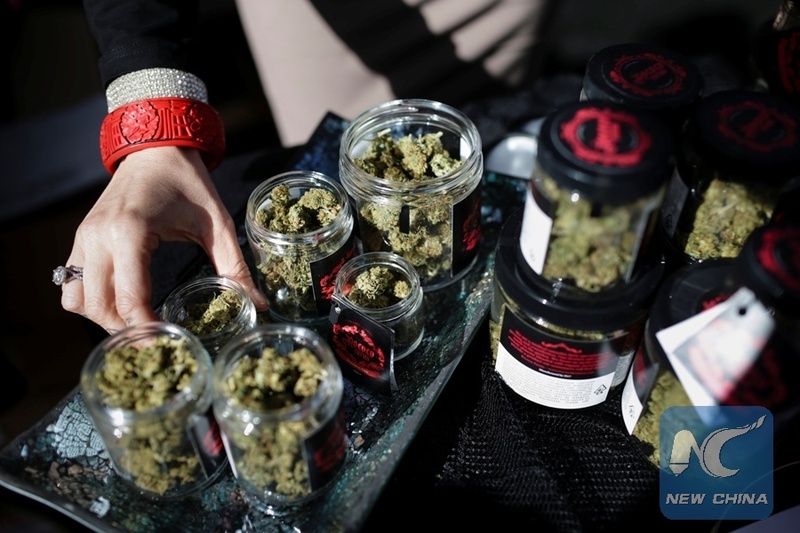 CHICAGO, Sept. 5 (Xinhua) -- College students' use of marijuana was at the highest levels seen in the past three decades in 2016, and the trend remained true in 2017, according to the annual national Monitoring the Future Panel study. In 2017, 38 percent of full-time college students aged 19-22 reported using marijuana at least once in the prior 12 months, and 21 percent reported using at least once in the prior 30 days. Both the prevalence levels peaked in 2016, the highest found since 1987, and did not change significantly in 2017. The 2017 prevalence levels represent gradual increases since 2006 when they were 30 percent and 17 percent, respectively. Daily or near daily use of marijuana, defined as having used on 20 or more occasions in the prior 30 days, was at 4.4 percent in 2017 for college students. This has remained steady for the past three years, down from a peak of 5.9 percent in 2014. A study of the University of Michigan (UM) further found that heavy marijuana use among youth not in college is also on the rise. Marijuana use among same-age high school graduates who are not full-time college students tends to be higher: the annual prevalence was 41 percent and 30-day prevalence was 28 percent in 2017, remaining at the highest levels since the 1980s. Daily marijuana use among same-age non-college youth reached its highest level of 13.2 percent in 2017, doubling over the past decade and up from 6.7 percent in 2006. The gap between college and non-college youth has widened in the past three years, with daily marijuana use being three times as high among non-college youth as among college students, the study shows. The study found that there are multiple reasons for the continuing increase in marijuana use among college students and non-college youth. One likely reason is the ongoing decline in perceptions of risk of harm from regular marijuana use. In 2017, 27 percent of those aged 19-22 perceived regular use of marijuana as carrying great risk of harm, the lowest level since 1980. "The continued increase of daily marijuana use among non-college youth is especially worrisome," said John Schulenberg, principal investigator of the Monitoring the Future Panel Study. "The brain is still growing in the early 20s, and the scientific evidence indicates that heavy marijuana use can be detrimental to cognitive functioning and mental health."